100cm (40in) wide. Price is per metre and more than 1 metre will be sent as one continuous length. 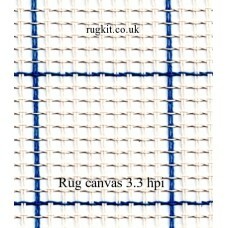 Single thread canvas with blue line every..
Zweigart rug canvas in single pieces (3.3 hpi) 27"x49"
68cm (27in) wide by 125cm (49in) long. This is a single cut piece of canvas and more than 1 will be sent as seperate lengths. 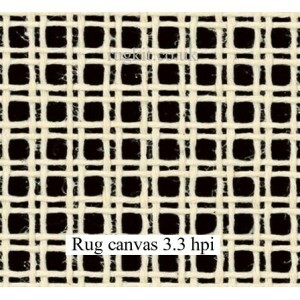 3.3 holes per ..
Zweigart rug canvas in single pieces (3.3 hpi) 60"x80"
150cm (60in) wide by 220cm (80in) long. This is a single cut piece of canvas and more than 1 will be sent as seperate lengths. Single thread..
100cm (40in) wide. This is a single cut piece of canvas and more than 1 will be sent as seperate lengths. Double thread canvas, 3.3 holes pe..
Zweigart rug canvas in single pieces (3.3hpi) 24"x24"
60cm (24in) wide by 60cm (24in) long. This is a single cut piece of canvas and more than 1 will be sent as seperate lengths. Double thread c..
60cm (24in) wide by 130cm (51in) long. This is a single cut piece of canvas and more than 1 will be sent as seperate lengths. 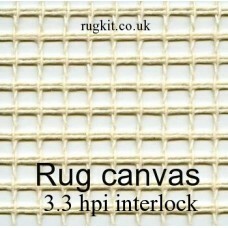 Double thread ..
Zweigart rug canvas in single pieces (3.3hpi) 24"x60"
60cm (24in) wide by 150cm (60in) long. This is a single cut piece of canvas and more than 1 will be sent as seperate lengths. Double thread ..